Elliott Teaford: Anaheim Ducks forward Ondrej Kase has an upper-body injury and didn’t skate yesterday. He only had limited minutes in the third period Thursday. Fluto Shinzawa: Boston Bruins Anders Bjork is having another shoulder surgery and will be out for five to six months. Mike Heika: Dallas Stars forwards Tyler Pitlick and Valeri Nichushkin didn’t practice yesterday and won’t be the lineup today. Jameson Olive: Florida Panthers goaltender Vincent Trocheck returned to the lineup last night. Philadelphia Flyers: GM Chuck Fletcher updating some injured Flyers. Josh Yohe: Pittsburgh Penguins forward Patric Hornqvist wasn’t able to go last night but he is doing better. 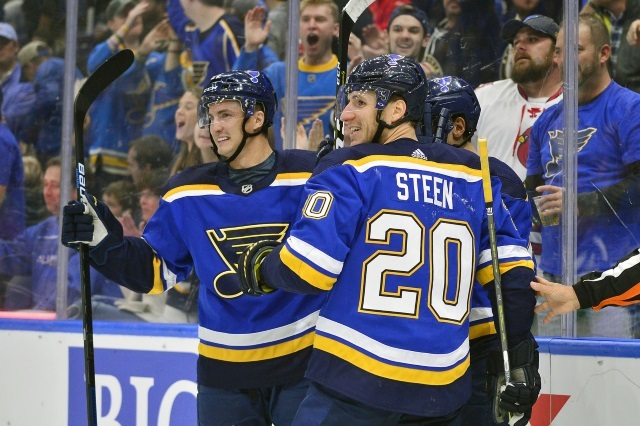 Jim Thomas of the St. Louis Post-Dispatch: St. Louis Blues coach Craig Berube said that Alex Steen is getting close to returning and could play during their road trip. Steen is on the IR along with Robert Thomas (shoulder) and Tyler Bozak (concussion). Zach Sanford was injured on Tuesday and is going through concussion protocol. Paul Hendrick: Toronto Maple Leafs goaltender Garret Sparks returned last night after missing the past seven games with a concussion. Ben Gotz: Vegas Golden Knights coach Gerard Gallant won’t commit to defenseman Colin Miller returning to the lineup today. Gallant did say that he is close.